We can distinguish the nature of such innovation project cases by a) the underlying innovation type and b) the desired impact of the innovative change they seek to produce. But did you know that people’s enjoyment of, and performance in, a particular innovation project depends on their preferred cognitive styles and innovator profile? Today, let’s explore what TIPS innovator types tend to fit to what kind of innovation types. TIPS is a new innovation people profiling method that I created for my innovation company Thinkergy. The method helps people to identify which of the four TIPS bases (Theories, Ideas, People, Systems) they are naturally attracted to, and also determines their preferred styles to think, work, interact and live. Based on the online test results, a person is assigned one of 11 TIPS innovator profiles that fall into three categories:: four pure profiles that rest on one base (Theorist, Ideator, Partner, Systematizer); six dual profiles that play on two bases (Conceptualizer, Promoter, Organizer, Technocrat, Coach and Experimenter); and one multiple profile (All-Rounder) that balances all bases. Operational innovations target to improve internal processes and operational structures. The related innovation types are process innovation and structure innovation. Value innovations focus on producing new, original and —in particular— meaningful value propositions (products, services, solutions, customer experiences and dreams (or as Tom Peters calls them, experiences plus)). Innovation types that target new value creation are product innovation (sometimes also called new product development), service innovation, solution design, and customer experience design. 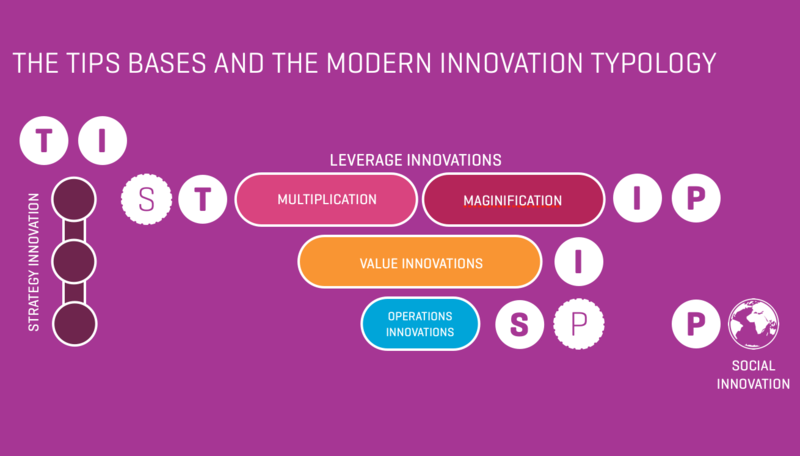 Innovation types that leverage through multiplication allow you to multiply the impact — and revenues— of an innovative value through new distribution channels, new platforms, networks and strategic partnerships, and innovative business models. 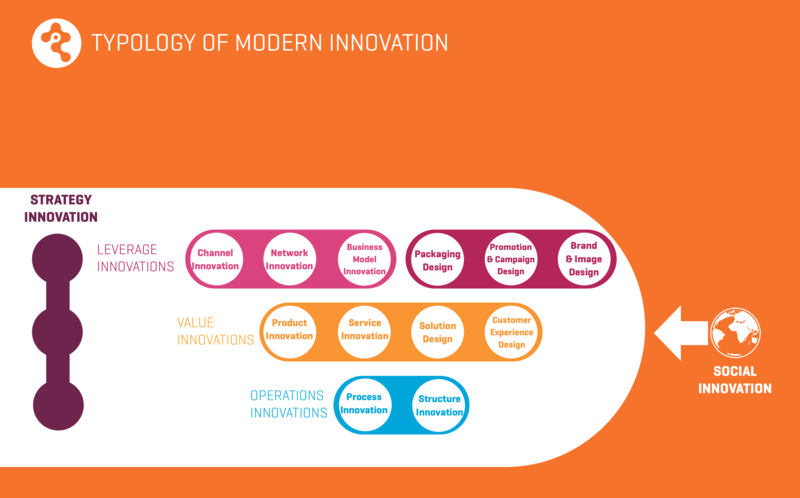 Related innovation types are channel innovation, platform and network innovation, and business model innovation. In contrast, innovation types that leverage through magnification aim to make an innovative value offering appear to be even more valuable through a strong brand and exclusive image, thus allowing for higher prices and profit margins. Innovation types that enhance value through design include brand design, image campaign and promotion design, and packaging design. Strategy innovation aims to reposition a business for sustainable and superior growth by working on all previous four levels (superior new value offerings produced at lower operational cost and leveraged with modern channels and design). Finally, social innovation aims to improve the lot of the less fortunate members of society and the environment. Larry Keeley discusses ten innovation types in a book titled The Ten Types of Innovation. In an earlier blog article titled “The innovation world is more than just black and white”, I expanded on Keeley’s ten innovation types and categorised them as described above. In this connection, please note that before you start a new innovation project targeting a particular innovation type, you should be aware that you have to follow certain application rules of the innovation types game (see the separate article titled “The ten rules of the innovation types game (parts 1 and 2)”). Operational innovations are largely Systems-driven. If you’re profiled as a Systematizer, Organizer, Technocrat or Systematic Experimenter, you’re likely to enjoy working on innovation projects targeting internal processes and operational structure. Value innovations are dominated by the profiles at the Ideas-base. Ideators, Conceptualizers, Promoters and Imaginative Experimenters dominate innovation projects that aim to create meaningful new products, services, solutions and experiences that delight customers. Theories-based profile types (Theorists, Conceptualizers, Technocrats, and —to a lesser extent— Systematizers) appreciate if they can apply their quantitative-conceptual cognitive style to innovation types that leverage through multiplication (focusing on new channels, networks, platforms, and business models). In contrast, innovation types that leverage through magnification (brand, campaign, promotion and packaging design) are often driven by the profiles at the Ideas- and People-base (Promoters, Ideators, and Partners). Strategy innovation projects are spearheaded by the conceptual profiles at the TIPS bases Theories and Ideas (in particular Conceptualizers, but also Theorists and Ideators). Finally, the profiles surrounding the People-base (Partners, Promoters, Organizers and Coaches) love working on social innovation initiatives. 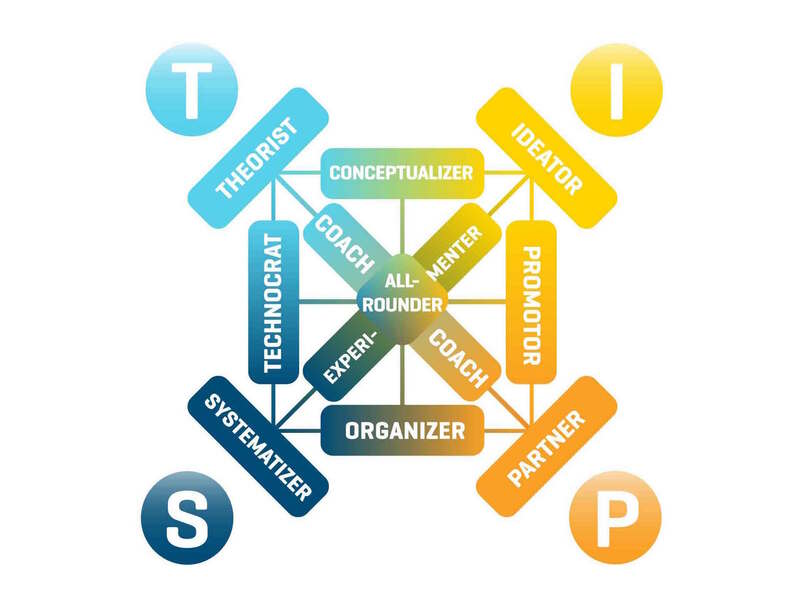 The TIPS bases help explain not only what types of projects the different TIPS innovator profiles enjoy working on, but also the degree of change that they naturally prefer. 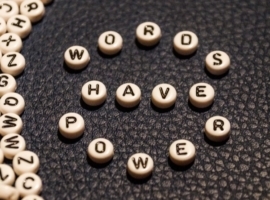 Innovation equates to a positive change and a departure from the status quo. Thereby, different innovations vary in the degree of positive change that they produce. 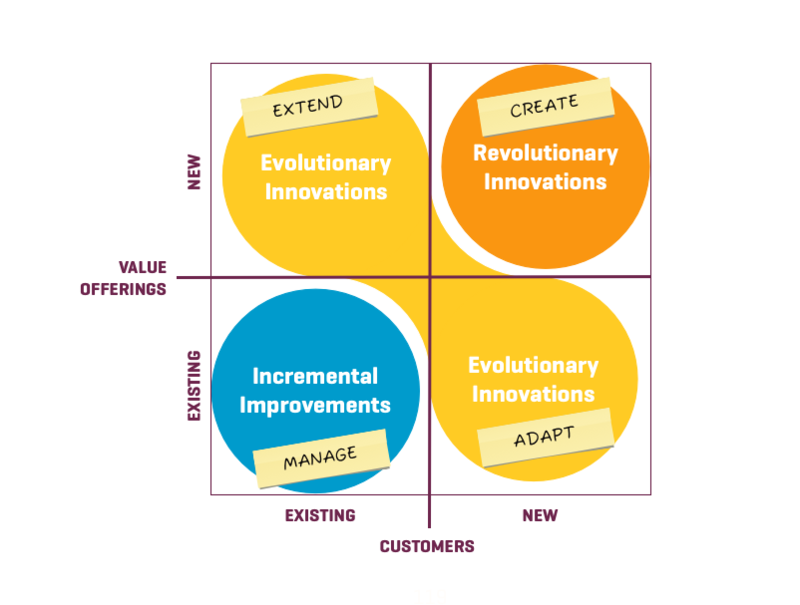 We can categorize innovations into three different intensity levels based on the impact that a change has: incremental improvements (typically of an existing product marketed to an existing user base), evolutionary innovations and revolutionary innovations (disruptive new products allowing a firm to wow existing users and convert new customers). Moreover, evolutionary innovations can be further differentiated as to whether they focus on adding new value to existing users, or if they extend an existing value offering to new customer groups. These differences can be mapped out in an innovation-impact type matrix that is shown below. 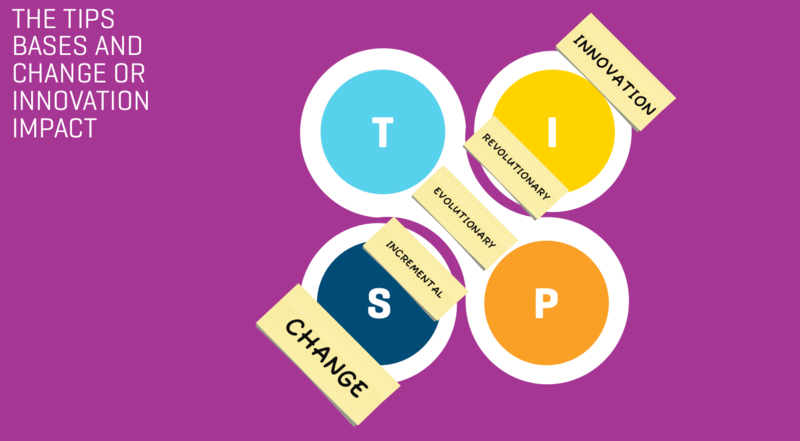 How much change do innovators at the four TIPS bases prefer to produce? The innovator profiles at the Systems–base (Systematizer, Organizer, Technocrat and Systematic Experimenter) tend to focus more on incremental improvements by practicing a more adaptive innovation style. They are satisfied with incremental change because in general, they prefer preserving the status quo. In contrast, the dynamic innovator profiles surrounding the TIPS base Ideas (Ideator, Conceptualizer, Promoter and Imaginative Experimenter) like to drive bold, radical change. They really enjoy pushing for revolutionary change and creating disruptive innovations, which they find more exciting than satisfying with an evolutionary innovation or —how boring — wasting their time and creative zest in projects targeting only incremental improvements. Finally, the profiles at the Theories– and People-base can support either the incremental innovation efforts at the Systems-base or the more revolutionary innovation projects of the Ideas-base. But what they really enjoy most is working on projects targeting evolutionary innovations. Thereby, the profiles surrounding the Theories-base prefer to create more and new value to existing users, while the innovator profiles surrounding the People-base enjoy looking for novel ways to extend existing value offerings to new user groups. Before you start a new innovation initiative, determine a) what innovation type the project focuses on, and b) how much change you target. Then, assign a person with a suitable innovator profile to lead the innovation initiative. Finally, invite those people to join the innovation project team who naturally enjoy this type of project based on their TIPS innovator profile, base orientation and related cognitive styles. 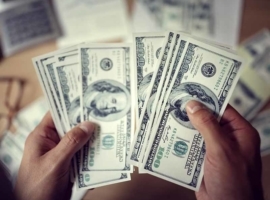 Are you interested in determining your personal TIPS innovator profile? Or would you like to learn more about how to apply TIPS in business and innovation in an experiential 1-day training course, the TIPS Innovation Profiling Workshop? Contact us and let us know more about how we may support you. Next article Is your mind set on a genius mindset?